The organic results (non paid) are now including local places results. They are combined on certain searches by the Google algorithm. You will sometimes notice the map on the right hand side of the results. This is a region where we are trained to look for advertising or not look for advertising. Note heat maps are created from users who are tracked whilst conducting searches in controlled research labs. This is going to make it harder for companies that don't have a local presence. There is also a local places spam team at Google to look for sites trying to spam the system. This also puts a premium on the paid listings for people wanting to reach a certain market without a physical presence. That could translate to more income for Google. You could theoretically be a second class citizen if you are physically not there. 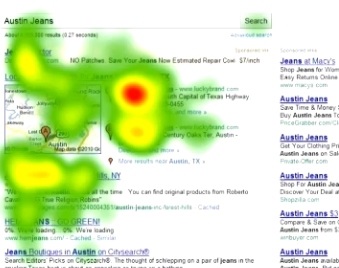 Heat maps indicate people do not click on the maps however it is used to indicate a local search. Refer to the map image. Makes it harder for non locals to enter a market which can be a benefit to legitimate businesses in an area. and then try to sell it or rent it. The myriad of reviews and spammy links used by some SEO companies is going to be downplayed. SEO constantly evolves - I started SEO before Google existed and many of the moves we see are a result of people trying to manipulate results. If you have seen a dramatic drop in your results - or you have been advised to go to spammy sites and add reviews etc - you need better advice - a good site with structure and relevant content will out do poorly made spammy sites and Google continues to find ways of counteracting the cheats or those that only have one or two techniques that eventually everyone uses. That is why we are first web developers with our own systems and secondly making sure the clients get to the top of Google ahead of the pack or also rans.